Are you satisfied with your training? – Yes, I am satisfied but there is always something to improve. I had opportunity to do a very good sparring training with a lot of good and strong friends! Do you think that there was enough time for preparation? If there was an opportunity - what else would you add to the training process? – The time is never enough but anyway I hope I will show good results. Maybe if I had more time I would have trained and rested more, but with my work it is not possible. What do you think, what methods / techniques will your opponent use against you? – Most of Italian guys use top roll but probably my opponent will use hook. What do you wish the participants of the supermatch and Vendetta? – I wish everybody good luck and to finish the competition safe and without injuries! 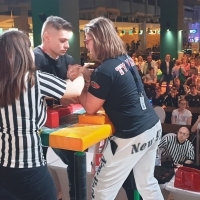 Show some good matches, sportsmanship and let's hope soon armwrestling will be in the Olympic games! Alex Kurdecha: "It was a super match!" Super Match XIII is over!